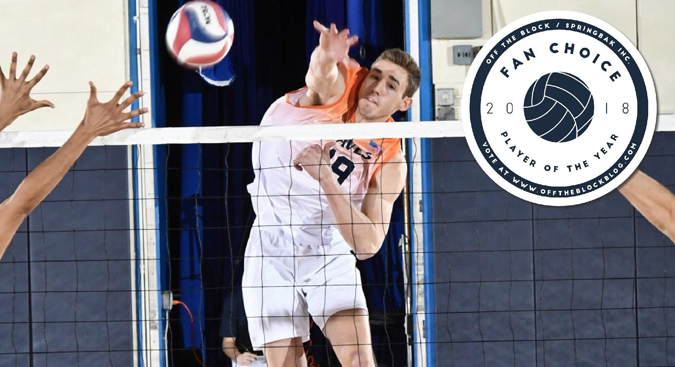 The fans have spoken, and Pepperdine All-American outside attacker David Wieczorek is once again earning a national award. Wieczorek received the most votes in the four-person championship round that ended Friday night to win the 2018 Off the Block/Springbak, Inc. Fan Choice National Player of the Year. The Off the Block/Springbak, Inc. Fan Choice National Player of the Year recognizes the best individual performances from NCAA Division I-II men’s volleyball players during the season and allows volleyball fans from around the world to decide the winner through online voting. The annual bracket-style tournament on the Off the Block website had more than 35,000 votes. Wieczorek led the MPSF and was fourth in the nation averaging 4.00 kills per game and hit .349 as he was named the 2018 MPSF Player of the Year. The All-American and Karch Kiraly Award finalist also was third in the nation with a 0.57 aces per game average and had multiple aces in 11 matches. This is the third consecutive year that Wieczorek won the Fan Choice National Player of the Year. Wieczorek had a combined 2,635 votes throughout the five-round tournament. In addition, Wieczorek earned 52.3 percent of the total vote in the championship round — more than 25 percentage points ahead of the runner-up CSUN opposite Arvis Greene. UC Santa Barbara outside attacker Corey Chavers ended the championship round in the third place with 12 percent of the vote, while UC Irvine outside attacker Aaron Koubi garnered 10.4 percent of the vote. All four players advanced to the championship round after winning their region in the 64-player tournament. Wieczorek is the first three-time winner of the Fan Choice National Player of the Year in the eight-year history of the award. Previous winners include Loyola outside attacker Mike Bunting in 2011, Ball State middle attacker Matt Leske in 2012, Fort Wayne outside attacker Eddie Rivera in 2013, the BYU outside attacker Taylor Sander in 2014 and Coker opposite Artur Cabral in 2015. Off the Block is a website that launched in 2011 and is the nation’s leaders in college men’s volleyball coverage. Springbak is the official sponsor of the 2018 Fan Choice National Player of the Year and produces high performance footwear used by professional athletes from the NFL, NBA, MLB and U.S. Olympic teams and the top college teams in the nation.